Our first night here was fabulous. Dark and silent, with a cloud cover that hid the stars. We did get lucky however last night, with crystal clear skies. Around 4AM I woke and walked outside for a bit just to soak up the brilliance. With no moon it was perfect stargazing time. Funny, I thought of Al, because for the life of me I could not find Orion. Usually the easiest one out there! One of the displays at the visitor center talked about the night skies saying that with so many stars it is sometimes hard to see the ones you are familiar with, they don’t stand out as much. 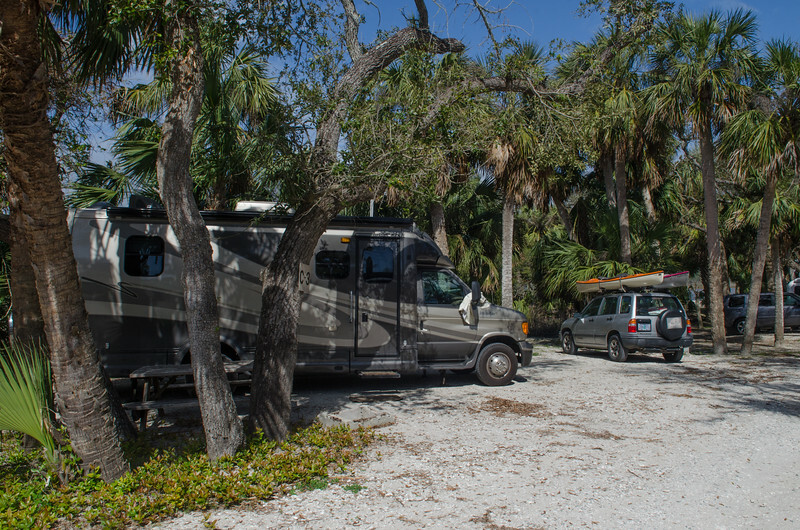 After a quiet sunrise, we enjoyed breakfast and coffee and computing at a leisurely pace before heading out for the Visitor Center. The Kris Eggle Visitor Center is quite lovely, very well done, and the Rangers were extremely helpful and friendly. We received our maps, checked out the environmental displays, and perused the tee shirts. Yes, I bought one. Silly me, I hardly wear them any more but this time it was a “Advice from an Organ Pipe”. I couldn't resist. I also couldn’t resist purchasing one of my collectible national park books and a great Falcon Guide to Sonora Desert Wildflowers. I do love my flower books, and don’t remind me that I can always find stuff on the internet! I have managed to keep up reasonably well with processing and uploading photos, writing blogs, and keeping track of finances. So Far. This morning feels a bit tight, however, but I know full well that if I get behind I will never catch up again. The generator is running for a bit, charging the phones and computers, making a pot of good strong coffee, and of course, charging up the batteries. That part really isn’t necessary since we will be on the road in an hour, but I don’t like to charge electronics with the inverter as we are traveling. For some reason the voltage isn’t quite right. 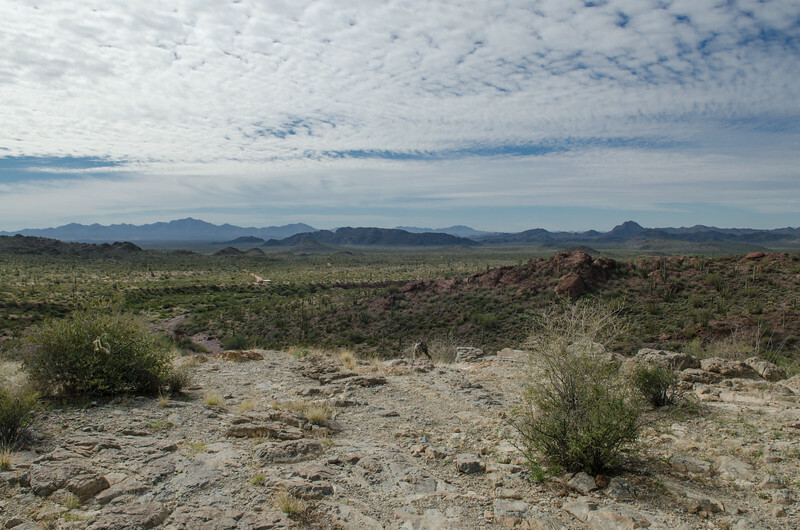 After visiting the Visitor Center, we opted to spend our time driving the Ajo Mountain Road. We spent about 4 hours or so meandering along, reading the great guide and enjoying each stop. I had asked at the Visitor Center at locating cristate saguaros, and without much difficulty we found some. 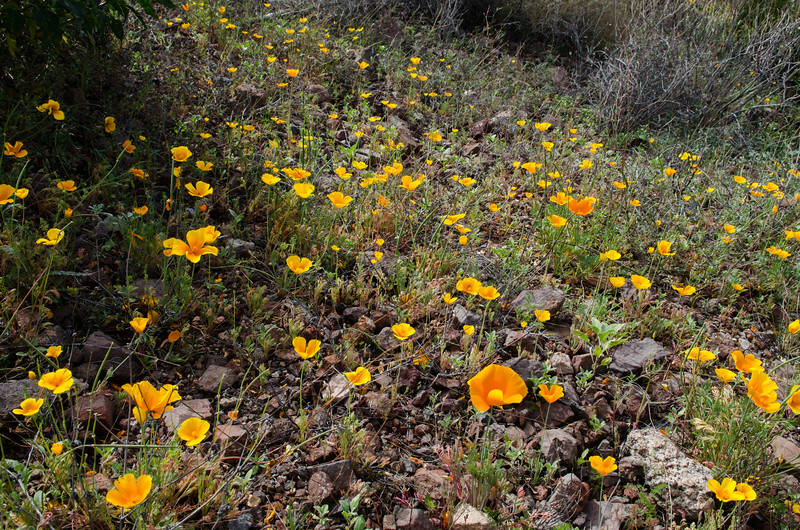 I hiked up the hill to get a closer look and was thrilled by the carpets of Mexican poppies on the slope. Of course, until I read my flower book I thought they were California poppies! We also had fun trying to find the arches that were described in the Not So Junior Ranger booklet that we followed as well. 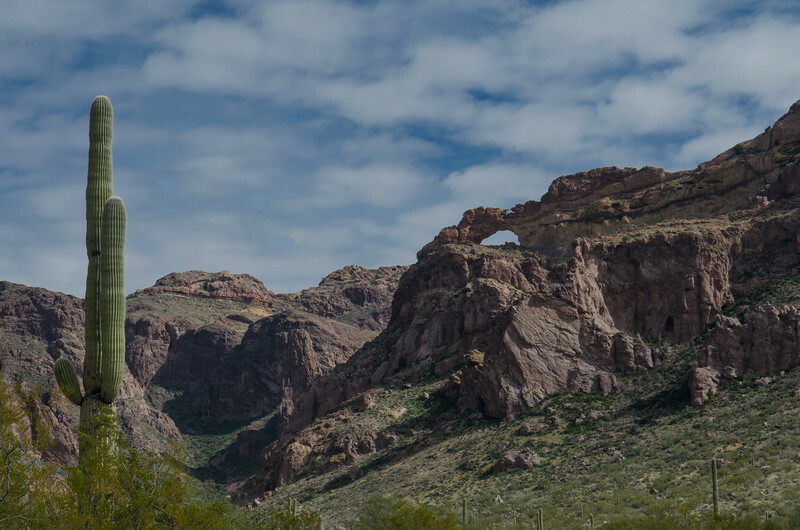 The dramatic Ajo Mountains are formed in fairly young volcanics, with lots of rhyolite and dykes and seams of quartz here and there. I did attempt to get a handle on the geology, but most of the information was either in books to buy on Amazon or pdf studies that required some sort of login. No matter. I can recognize volcanics when I see them, and this area looks a lot like the rhyolite volcanic rock that is in Oregon around John Day Country. 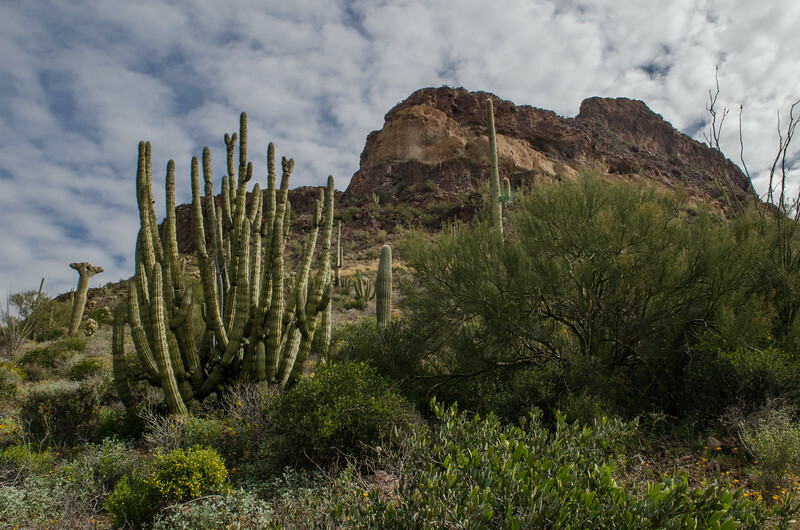 We learned that the Organ Pipe Cactus is all over the Sonoran Desert in Mexico, but here in the US it is rare, and only found in this area where it has been protected by the monument. They are an interesting cactus, but for us not as charming as the beloved saguaro. We found a magnificent specimen of saguaro that was just begging to be photographed. 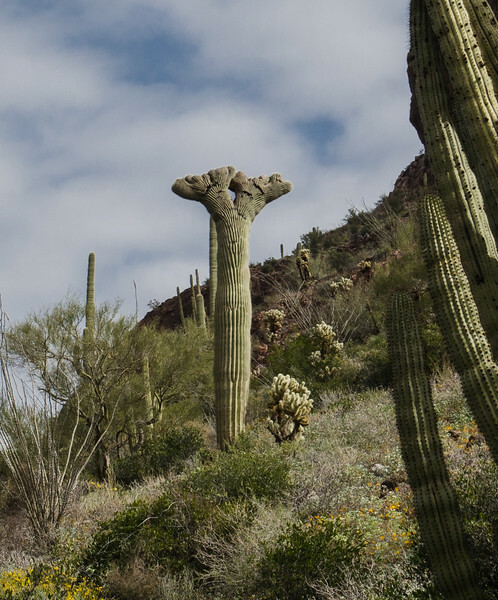 After walking the Visitor Center Trail, where we learned about nurse palo verde trees that help the saguaros through their youth, we saw examples of them everywhere. We also enjoyed seeing the various kinds of cholla, in addition to the familiar Teddy Bear cholla that we see in Joshua Tree and around other parts of the desert. I especially loved learning about the ecology of the Sonora Desert compared to the other deserts of the Western Americas. Such a lush, green, magnificent place! 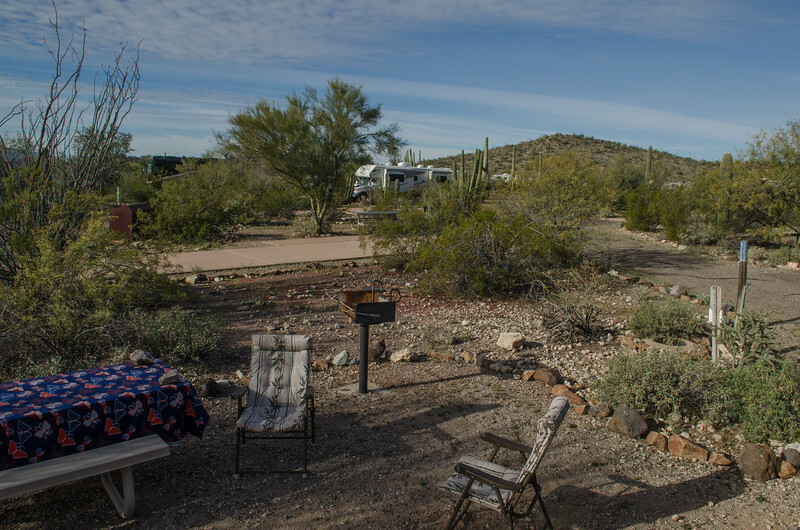 The Ajo Mountain drive definitely added to our understanding of the symbiosis of plants and animals and weather in this part of the world. We came home mid afternoon and took Mattie for a nice walk on the Campground Perimeter Trail, where she is allowed to walk. After that little bit of exercise, we left her safely in the comfortable MoHo and took off in the Tracker. 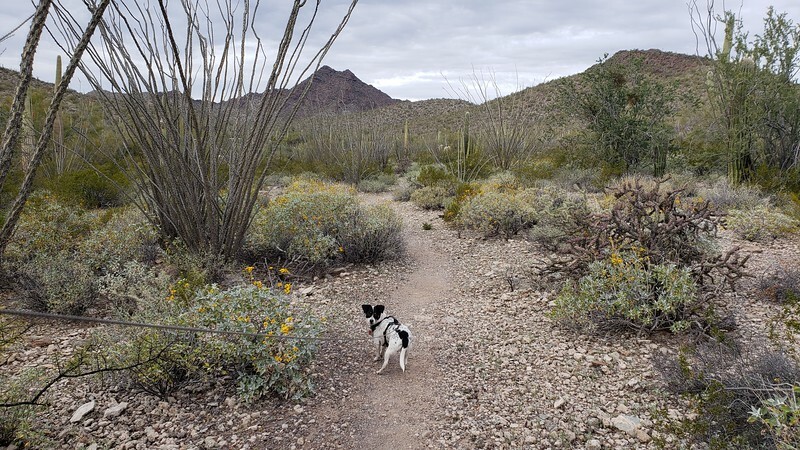 The Ranger had suggested the Senita Basin for lovely hikes and ecological wonders. 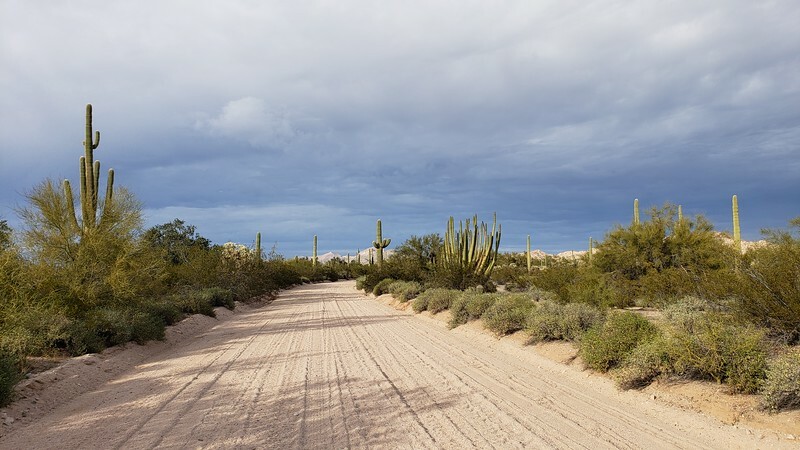 Driving south on 85, we turned west just north of the Mexican border and followed the very rough, washboard gravel and dirt road west. We came close to a part of the border where there was a tall strong looking fence going over the mountain, but couldn’t see where it continued east along the lower valley floor. As we rounded the road bend where we were adjacent to the border, we saw a low rail fence, more a barrier to vehicles than to people. There were many border patrol vehicles around, some driving very fast, and I would pull over to let them by. Our hope for viewing the trails at Senita Basin were dashed by the extremely heavy dark clouds we saw hanging over the sky above the campsite. Our awning was up, and we didn’t want it to break. Besides, driving on sandy wash roads during a rainstorm isn’t very smart. We gave up and turned around. It was a great day in spite of the aborted Senita Basin trip. We had a great supper watching another pretty but unspectacular sunset and the air was cool and perfect. Talking about our day, Mo reminded me of one of the things I love most about wild desert landscapes. No Telephone Poles! None in sight for miles and miles in all directions. I think Mo saw one somewhere near the Visitor Center but I didn’t see that one. Lucky me. I love my field guides better than online. I loved Ajo Mt Drive taking it several times. 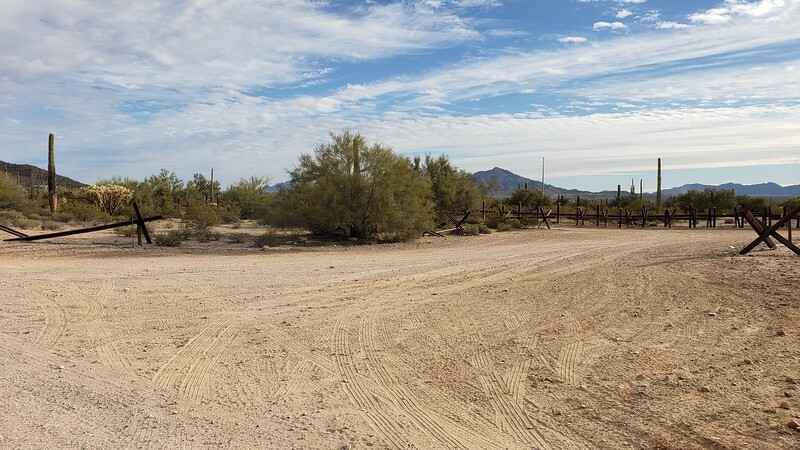 The southern border road not so much as the condition was awful and the fence/wall was an ugly distraction. Your wonderful photos bring it back to me. Wish I was there. It would have been nice to have you there, Gaelyn, you could have talked to me about all that geology I would bet. That wall was definitely ugly and weird. 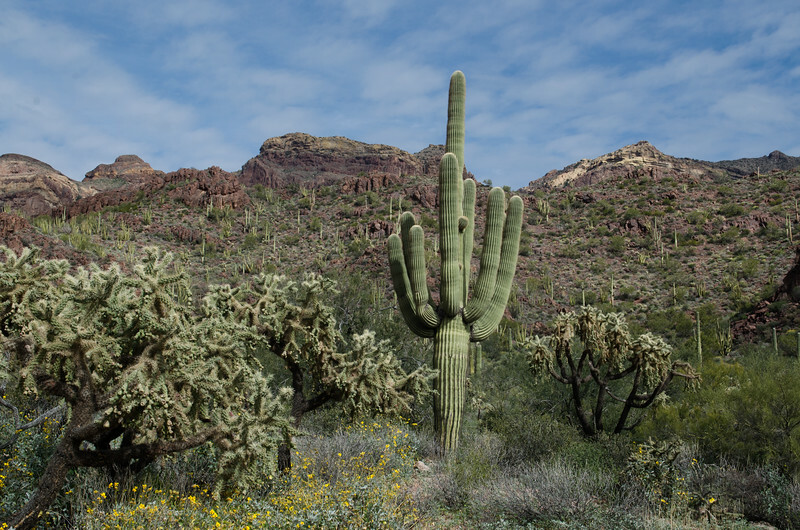 I think saguaros are my favorite of all the big cacti. Any landscape that doesn’t have telephone poles or power lines is my kind of landscape. I just discovered that responding to your comment on my notification email doesn't do a thing. 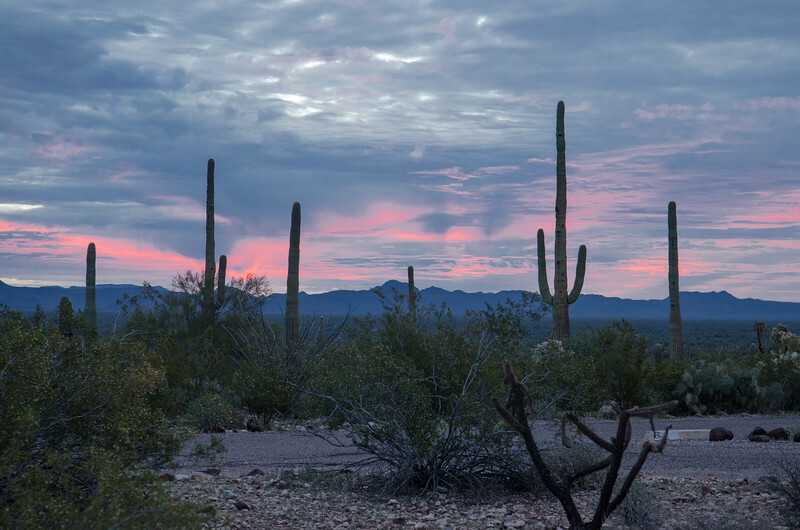 Yes, Erin, saguaros are the best. I had a botany professor in the 70's in Idaho who revered them. He did psychedelics and communed with them, and would share that in his lectures.